The years following the Second World War saw an explosion of craft art in America. Men and women from all walks of life and corners of the globe rediscovered and reinvigorated such traditional media as ceramics, fiber, glass, metal and wood. In our own region, Rochester Institute of Technology and Alfred University became major creative centers. Crafting Modernism is made possible through the generosity of the National Endowment for the Arts; the Henry Luce Foundation; and the Craft Research Fund of the Center for Craft, Creativity and Design. It was organized by the Museum of Arts and Design, New York City. In Rochester, it is sponsored by Harter Secrest & Emery LLP, with additional support from the Mabel Fenner Lyon Fund, the Gallery Council of the Memorial Art Gallery, Ron and Cathy Paprocki and Mann’s Jewelers. Support is also provided by the friends of Grant Holcomb in honor of his tenure as Director of the Memorial Art Gallery. Crafting Modernism was organized by curator Jeannine Falino and associate curator Jennifer Scanlan of the Museum of Arts and Design, where the show opened in October 2011. 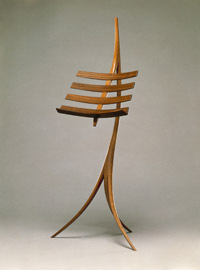 Evert Sodergren, Sculptured Chair (1953). Walnut and leather. Collection of Margaret Minnick. Claire Falkenstein, Pendant (1961). Glass, iron. The Dukoff Collection. Isamu Noguchi, Akari 820 Lamp (1951–52). Mino washi paper, bamboo, metal and electric cord. Noguchi Museum.